Rahul hits BJP with slowdown and scandal with faultless timing, but can it be termed a Congress reawakening? It’s almost like a battered bowler, categorised for long as military medium both in pace and in averages, suddenly getting new purchase from the pitch and knocking down a few wickets. Rahul Gandhi has spent years being portrayed as the sort of liability for the Congress who actually redounds to the credit of the rival camp—just by being himself. But fresh off a well-received tour of the US, and in the backdrop of the #VikasGandoThayoChhe campaign in Gujarat, his Navsarjan yatra has set off some ripples in the heart of Modi country. What impact his rallies and headline-grabbing quotable quotes would have on the voters of Gujarat can only be gauged when they cast their ballot in the year-end assembly elections. Rahul Gandhi bearding the lion in his den is the stuff of Congress fantasy at this stage—nothing more. The newly fragmented Gujarat polity may only scatter anti-incumbency votes. But his presence seems to have had two visible eff­ects: one, it has brought a spring back to the steps of Congressmen; and two, it has sparked off some serious unease in the BJP leadership. For a few seasons now, the power duo of PM Narendra Modi and BJP president Amit Shah have been striding like a colossus over India’s political map. Gujarat is their backyard, where they honed their politics—familiarising themselves with each nook and cranny, each alley—and later erected an impregnable fortress based on their mastery of the local social landscape. All past Con­gress attempts to breach it ended in failure. This time around, however, there are other factors—some internal, and some that go far beyond the state—that have brought an added salience, an extra buzz to the Congress vice-president’s campaign. 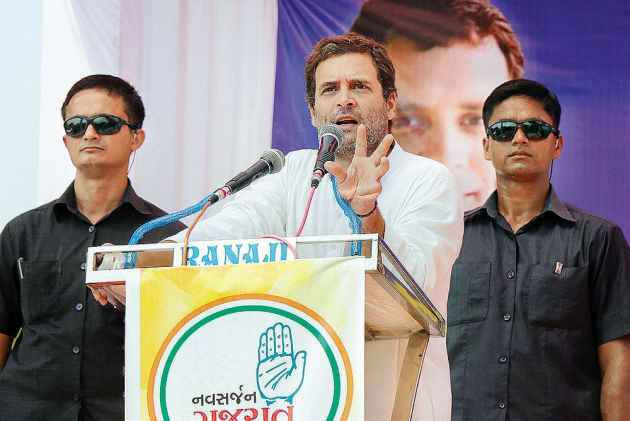 Rahul’s foray into Gujarat coincides with a rising mood across the country against the slowdown in the economy and growing job losses—an overall air of disappointment, even fear, vis-a-vis the lack of promised growth. Swimming into view at exactly this juncture—in another opportune coincidence for the Congress—is a controversy: the case of alleged nepotism and crony capitalism inv­olving BJP president Amit Shah and his bus­inessman son Jay, thro-ugh a recent expose by thewire.in, a news portal. The report claimed Jay Amit Shah’s firm saw a 16,000 times rise in turnover since the BJP came to power at the Centre in 2014. Denying any wrongdoing, Shah Junior has filed a criminal defamation suit against the news portal, while the BJP leadership has rallied around its president to argue that the report was baseless and such attempts to tarnish his image were not new. On his part, Amit Shah tried to counter Rahul’s narrative of lack of growth and despondency in Gujarat by venturing into Amethi, the Congress vice-president’s parliamentary constituency in Uttar Pradesh, and highlighting the poor state of development there. In the prevailing mood, this riposte by the BJP is being noticed more for its reactive nature. On the other hand, the buzz created by Rahul’s outreach programme in Gujarat indicates the 47-year-old Congress scion—whose formal coronation as party chief seems imminent—is perhaps being taken a little more seriously than in the past. Seasoned observers of the party advice caution, asking enthusiasts not to go overboard with these positive ripples. “We had seen a similar buzz in UP last year. But the BJP managed to counter it eff­ectively and turn the tide in its favour with the surgical strikes and the campaign against black money with demonetisation,” says one. For, not only is Modi a brilliant communicator, he has Shah’s political management skills and an extremely efficient party network in Gujarat to fall back on. Meanwhile, the weakness in Congress’s organisation remains glaring: it has no strong local ‘leader’ figure, and has been further damaged in this election year by Shankersinh Vaghela’s rebellion. The party has been unable to increase its seats in the assembly despite maintaining a near 40 per cent voteshare. What’s more, the number of vote-splintering elements has gone up. Besides Vaghela, in pockets there will be the JD(U), the NCP, AAP and sundry local outfits and independents. The disaffection among Patels and Dalits—what with the Patidar agitation and the post-Una movement—too may not have a decisive electoral impact if the sectors remain hostile to each other. Recent Patel-led atrocities on Dalits point to that likelihood, all of which diminish the chances of a cumulative ‘anti’ vote. Rahul may have broken out of his shell and started reaching out to people. But his engagements have so far been with small groups like students, tribals, dam oustees and anganwadi workers. But despite the ridicule—Union minister Smriti Irani even took potshots at Rahul’s attempt at the adivasi Timli dance—there is no denying that his one-liners look politically sharper. His dig on the PM that the “Beti bacchao campaign” has become “the beta bacchao” campaign (after the Jay Shah exp­ose) found resonance. So did his turning the ‘Shahzade’ (prince) jibe, with which Modi used to mock him, back on to the Shahs. For years, people had found it difficult to take Rahul seriously, and this reflected in low electoral returns. His frequent ‘absence of leave’, especially at crucial political junctures, had added to the image of a reluctant dynast. However, the mood started changing around his early September interaction with students at Berkley, where he spoke freely about the Modi regime’s “divisive” policies and how DeMo and GST had hurt the Indian economy. The sheer phalanx of top leaders the BJP deployed to counter him showed it was not taking Rahul lightly, for all its “diaper” jibes. This stems from the BJP’s understanding that the Nehru-Gandhi family, even in this moment of debility, has the capacity to be a core around which the Opposition can rally. The idea, therefore, is to counter it. So, the more traction Rahul started getting, the more it evoked ridicule and strong remarks from the BJP and the more it was getting noticed precisely for that reason. So, if Berkley students saw a new side of Rahul where they were tempted to revisit some of the negative ideas they had been fed about him, many Indians now saw in the government’s decision to field senior ministers against him as sure signs of nervousness. Unlike in the past, when anti-Rahul jokes were enjoyed and shared by people not limited to Modi bhakts, the tide is slowly turning with a surge in anti-Modi jokes. No doubt the economic downturn after DeMo and GST had a role in this. It’s in this atm­osphere that Rahul Gandhi launched his Navsarjan yatra in Gujarat—so the effects have spilled over too, almost in a continuum. The Congress is, naturally, upbeat and beginning to talk of a 2011 moment for the BJP—the year when the Man­mohan Singh government’s dec­line began—seeing the year-end election in Gujarat as a turning point. And yet, though the present disappointment with the prime minister’s failure to deliver his development promises may be justified, it’s too early to predict the end of Modi-magic. Past setbacks—losing both Delhi and Bihar—had not curtailed his enthusiasm or ability to bounce back. And Gujarat is home turf. But for now, Rahul has managed to light more than a spark. BJP general secretary Muralidhar Rao talks about why he thinks Rahul Gandhi is still not a ‘player’ in country’s political arena, the Jay Shah controversy and party’s south push.